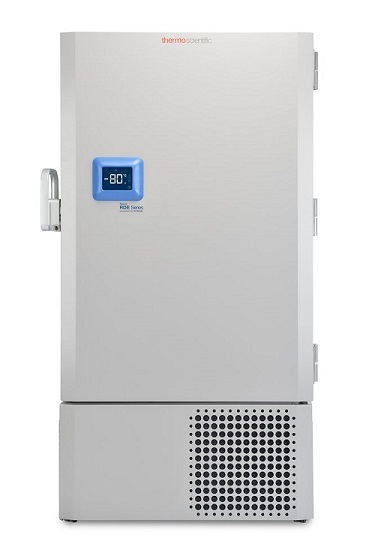 Thermo Scientific Revco RDE Series ultra-low temperature freezers, powered by H-drive, feature four upright models, maximizing storage capacity from 30,000 up to 60,000 2mL vials. The RDE Series is a sustainable and reliable solution with ultimate sample security and operational savings for every lab. Natural refrigerants and water-blown foam insulation, making the Series compliant with the U.S.
38.5 x 23 x 78 in. (97.7 x 58.4 x 198.1cm) 712 lb. European Plug 38.5 x 23 x 78 in. NEMA 5-20 Plug 38.5 x 28.3 x 78 in. (97.7 x 71.9 x 198.1cm) 687 lb. 38.5 x 28.3 x 78 in. European Plug 38.5 x 28.3 x 78 in. NEMA 5-20 Plug 38.5 x 34.0 x 78 in. (97.7 x 86.4 x 198.1cm) 734 lb. 38.5 x 34.0 x 78 in. European Plug 38.5 x 34.0 x 78 in. NEMA 5-20 Plug 38.5 x 39.6 x 78 in. (97.7 x 100.6 x 198.1cm) 820 lb. 38.5 x 39.6 x 78 in. European Plug 38.5 x 39.6 x 78 in.